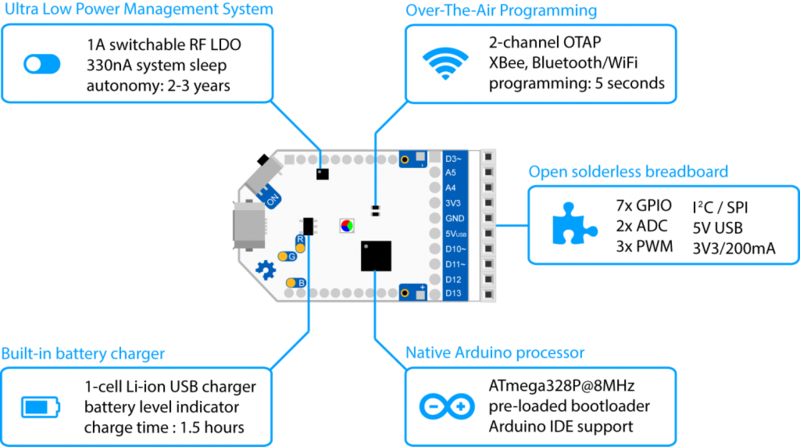 The AirBoard is a wireless, modular and ultra low-power prototyping platform for the Internet of Things (IoT), designed to explore, hack and deploy your killer idea in the field. 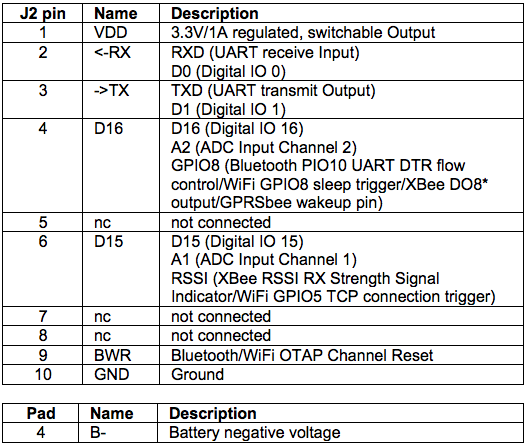 It features a « Bee » socket to host XBee, Bluetooth, BLE, WiFi, GSM/GPRS, SIGFOX and LoRa WAN shields, an open solderless breadboard and a built-in battery with ultra-low Power Management System for years of autonomy. 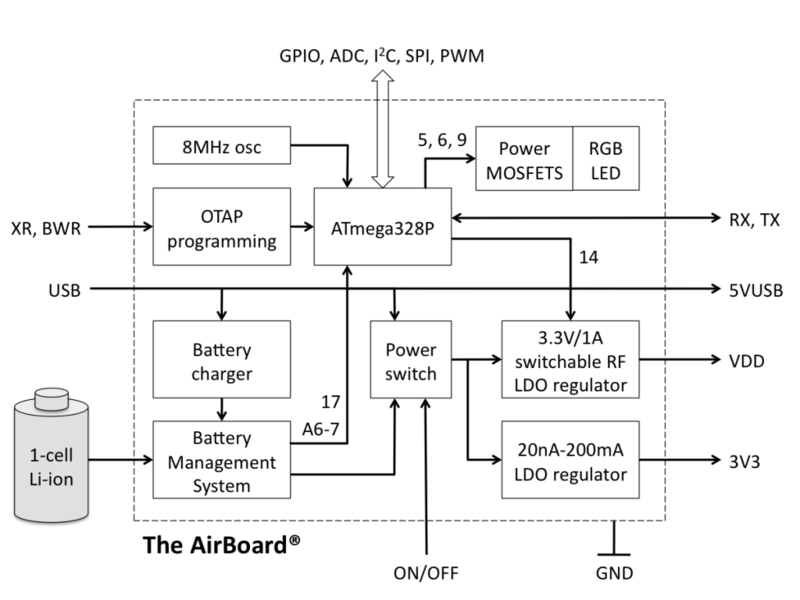 The AirBoard comes with a UL1642, CB/IEC62133, UN38.3 fully certified built-in battery. It passed all EMC, ESD, altitude, thermal, vibration, shock, drop, impact, crush, short-circuit, overcharge, discharge, fire & hazardous materials tests. 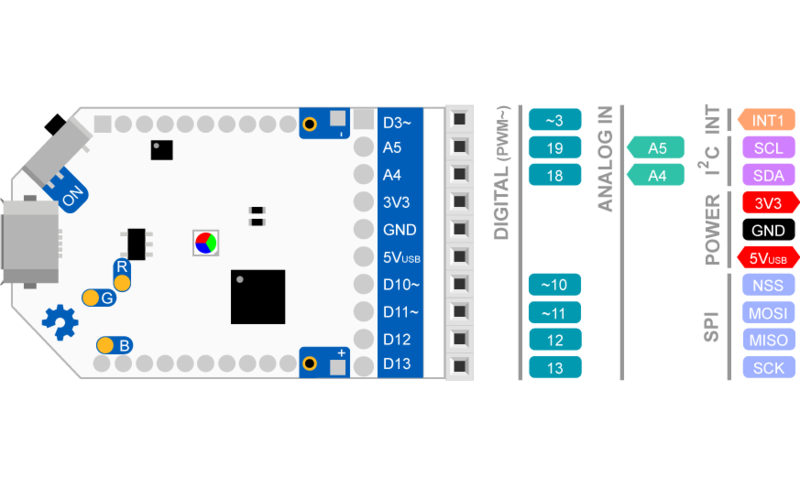 The AirBoard is an improved version of the Arduino Fio. Twice as small, more compact, with built-in LiPo battery and charger, Power and Battery Management System and power RGB LED, the AirBoard draws 70,000 times less power in sleep mode than an Arduino UNO. 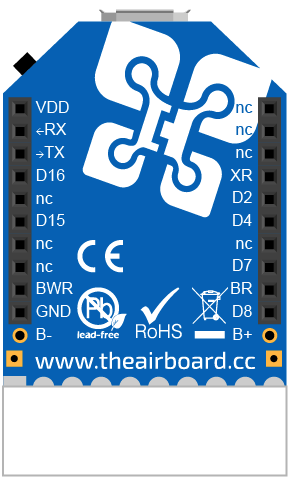 Much like the Fio, the AirBoard was designed to be programmable over-the-air via an external wireless shield, although featuring two independent channels for XBee and Bluetooth. NB The microUSB connector is used exclusively for battery charging. Therefore the USB port will not be recognized by your computer. 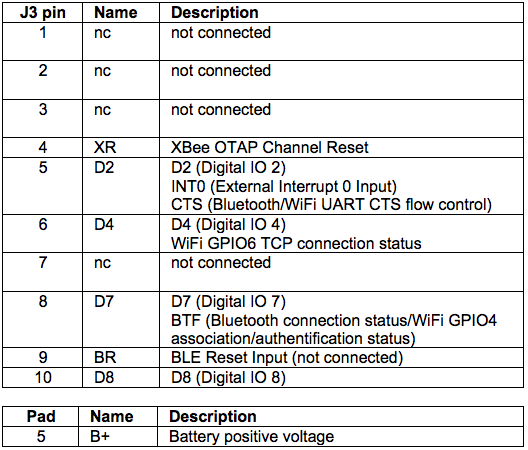 To upload a new program, you will need additional wireless shields such as XBee or BLE and their associated USB dongle, or an external FTDI cable. On the AirBoard Kickstarter Edition, J2 and J3 are 11-pin connectors which incorporate B+/B- pads to allow direct power of the GPRSbee shield. 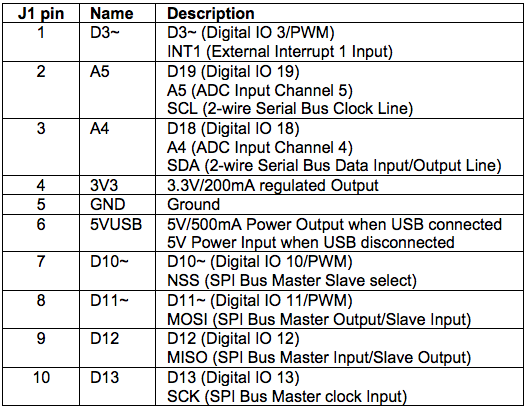 The new J2/J3 connectors are now 10-pins (also 2mm thinner) to avoid possible confusion when inserting wireless shields. GPRSbee can still be powered by B+ with your own connection. The AirBoard® is a registered trademark. This Reference Design is provided « AS IS » AND « WITH ALL FAULTS », WITHOUT ANY EXPRESS OR IMPLIED WARRANTY, INCLUDING BUT NOT LIMITED TO MERCHANTABILITY, SATISFACTORY QUALITY OR FITNESS FOR A PARTICULAR PURPOSE. You are free to share, copy and redistribute the material in any medium or format, adapt, remix, transform, and build upon the material. You must give appropriate credit, provide a link to the license, and indicate if changes were made, in any reasonable manner, but not in any way that suggests the licensor endorses you or your use.